Buenos Aires, Argentina - His Eminence Amfilohije, Archbishop of Cetinje and Metropolitan of Montenegro and the Littoral, as Bishop-Administrator of the Diocese of Buenos Aires and South-Central America arrived to Buenos Aires on 24 November 2014. The clergy of the Diocese, representatives of the Administration of the parish in Buenos Aires with the president of the church-school congregation and protodeacon Nikola Radisa as well as a few parishioners welcomed His Eminence int the Cathedral church of the Nativity of the Most Holy Mother of God. Bishop John of Caracas and South America of the Russian Orthodox Church in Exile was among those who welcomed His Eminence. On the feast of Saint John Chrysostom, on 26 November, the Metropolitan celebrated the Holy Hierarchal Liturgy in the Cathedral church of Most Holy Mother of God in Buenos Aires with the concelebration of presbyter Esteban Jovanovic and protodeacon Igor Balaban. Presbyter Branko Stanisic, parish priest in the province of Chaco, and presbyter Dusan Mihajlovic, parish priest of Santiago, the capital of Chile, sang responses. On the same day in the afternoon, Metropolitan Amfilohije met with Bishop John from the Russian Orthodox Church in Exile in his residence – the church of the Resurrection of Christ in Buenos Aires. The Metropolitan has been the Bishop-Administrator of the Diocese of Buenos Aires and South Central-America since the foundation in 2011 and this is the fourth time he has visited South America in this capacity. 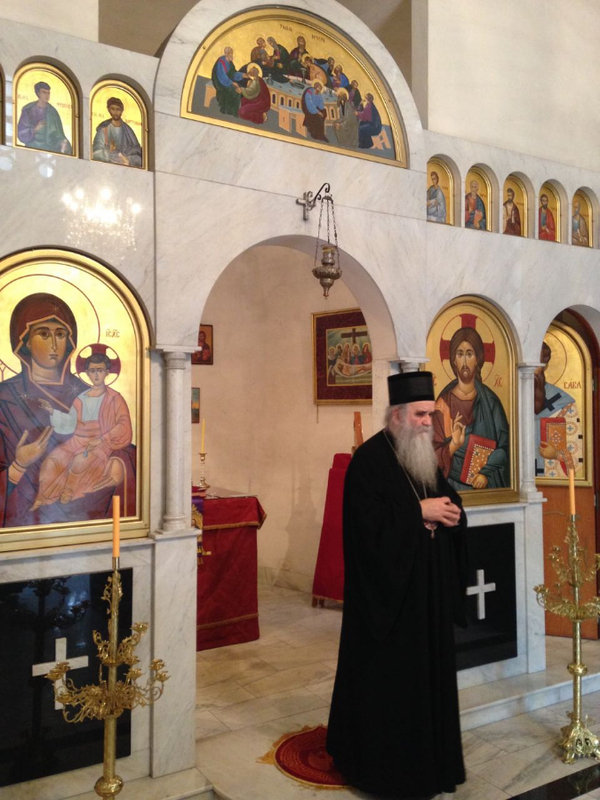 During his three-week stay Metropolitan Amfilohije is planning to visit parishes in Argentina, Brazil and Columbia, to meet with other Orthodox Bishops and to hold a few meetings with the aim of improving mission of the Orthodox Church on the South-American continent.